EntroPay was founded in 2003 and they are a big part of the eWallet market ever since. EntroPay always wanted to offer a secure and convenient solution for digital payments and therefore created their virtual Visa cards that can be use almost all over the globe where Visa cards are accepted. Their goal was to create a payment option especially for those customers who cannot do this transaction online with any other way. However, customers who are able to us a Skrill, NETELLER or ecoPayz account should definitely use one of those eWallet as they are much easier to handle and have overall better conditions. Especially, in combination with our highly attractive and free eWO Bonus Program you can benefit from instant VIP upgrades, lower fees, highest possible limits, a free MasterCard, multiple currency accounts, monthly cashback (up to 1%) and of course our personalized support. Please contact us for any questions about our eWallet program, so that we can help you to find the best solution for you. If you are not able to use Skrill, NETELLER or ecoPayz due to country restrictions entropay might be an option for you and we have summarized some more details and facts about their product. We want to show you how to set up your account, how to credit your cards with funds and show you the most important details about the limits and fees. 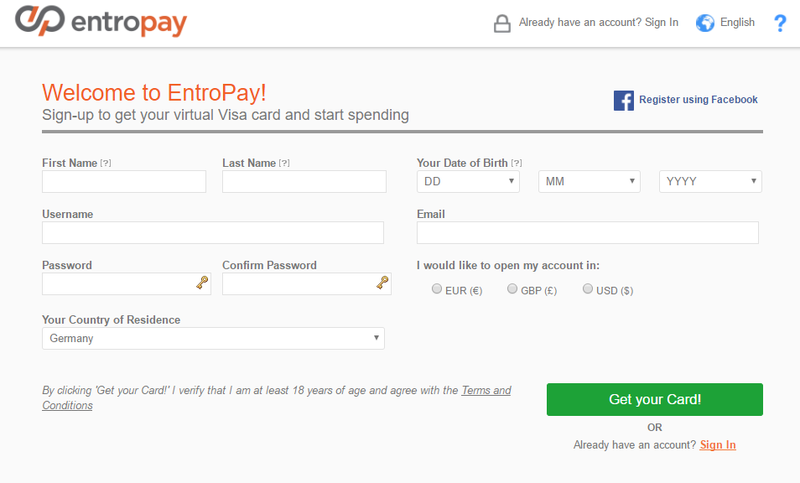 Creating your first virtual EntroPay Visa card is quite easy. You just need to fill-out the registration form and your card will instantly be ready. 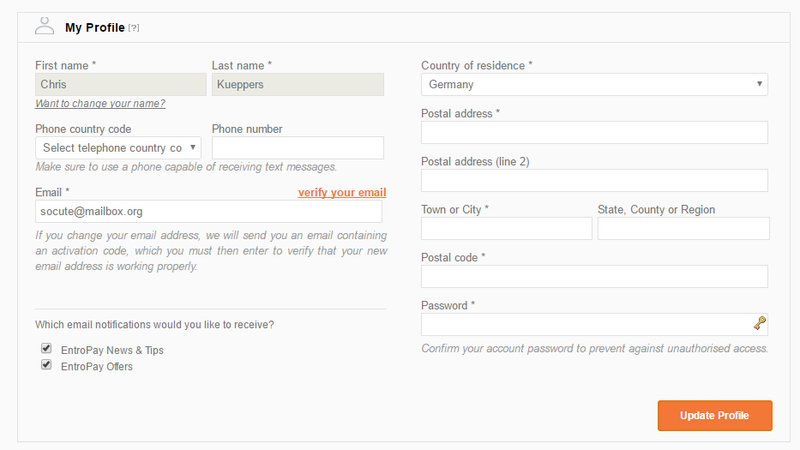 Just add some personal details like your full name, your country of residence, your password and your day of of birth. A current address is not needed as EntroPay does not send you a card to your home address, you will just have your virtual credit cards. Once you hit the “Get Your Card!” button at the registration form, you card will be created and you will be forwarded to the next step where you can upload funds to your card. You can easily upload funds to your EntroPay account by using a bank or wire transfer. The fee for this transfer is 1.95% and usually the amount will be credited within 2-5 business days (depending on your bank). However, bank transfers in EU are usually much faster as they are considered as local bank transfers. Once you choose the bank transfer option from the menu you just need to fill-out some details about your bank account like the location of your bank and the currency. After that, you will receive all information to initiate the bank transfer from your end. Please note that EntroPay does not have access to your bank account and no funds will be credited to your virtual card until you instruct your bank to initiate the bank transfer. Please also make sure to use the correct currency to avoid any currency exchange fess. 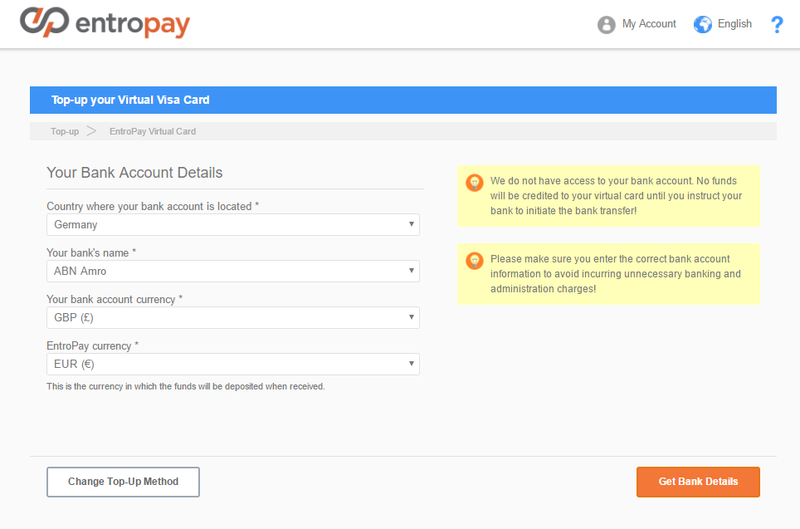 The second option you can use to upload funds to your virtual EntroPay card is using another credit card. The major benefit of this option is that your funds will be available instantly, so you do not have to wait before you can start spending them with your EntroPay card. The fee for this option is 4.95% and the maximum amount you can upload is 250,00 EUR. Just enter your Name, the credit card number and choose your preferred amount. You can use a Visa card, a MasterCard or Maestro card to up transfer money to your account. 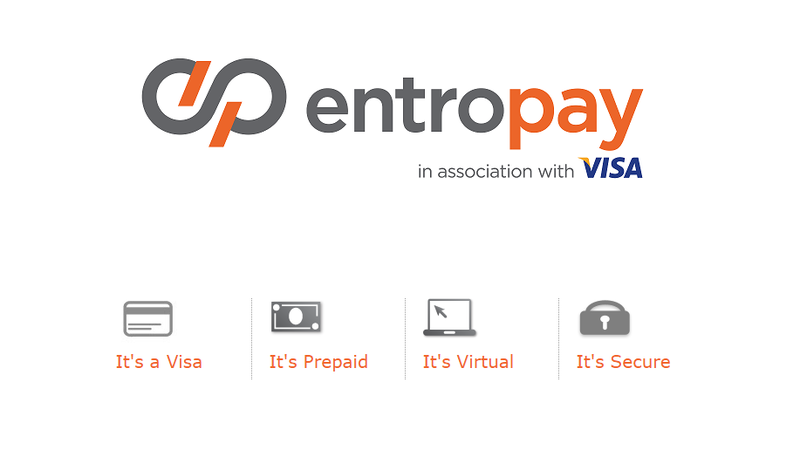 EntroPay offers 3 different account statuses. Once you have created your account you start with the lowest level – the “Starter” level. The main difference between the statuses are the account limits. By increasing your level you also increase all your transaction and withdrawal limits. You also increase the number of possible virtual cards, so that you can use more than one card. To get your account upgraded you need to provide additional personal information and fully verify it for the highest status. Let’s have a look at some more details for both options. To get upgraded to the Basic level you just need to verify the mail address you have used to register your account and you also need to provide your current address information. Once you have provided those personal details EntroPay will check it and upgrade your account afterwards. 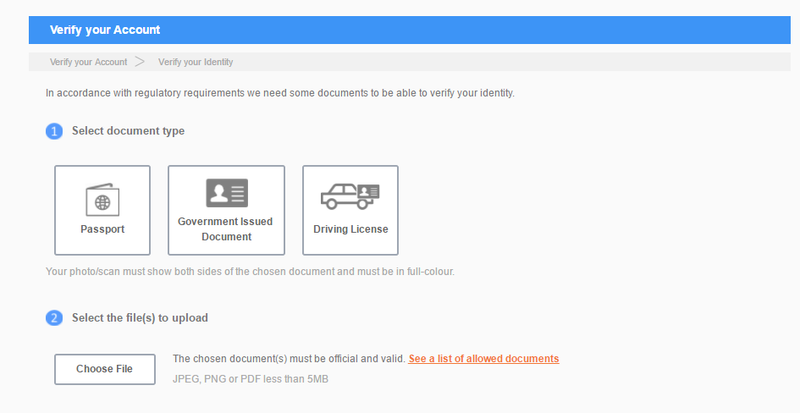 A copy of your passport (both sides), another government issued document or driving license. Your photo/scan must show both sides of the chosen document and must be in full-color. A document to verify your residential address like a utility bill (e.g. gas, electricity, phone), bank statement or credit card statement issued within the last 90 days. The following table will show you all important fees for your EntroPay account and the virtual credit cards. Fee varies dependent on destination country and currency. If you have any questions about the fees, please contact us . We are happy to help. Foreign exchange fee on purchases. Load funds from a credit/debit card. Payments to a personal bank account. Inactivity Fee (after 6 months). 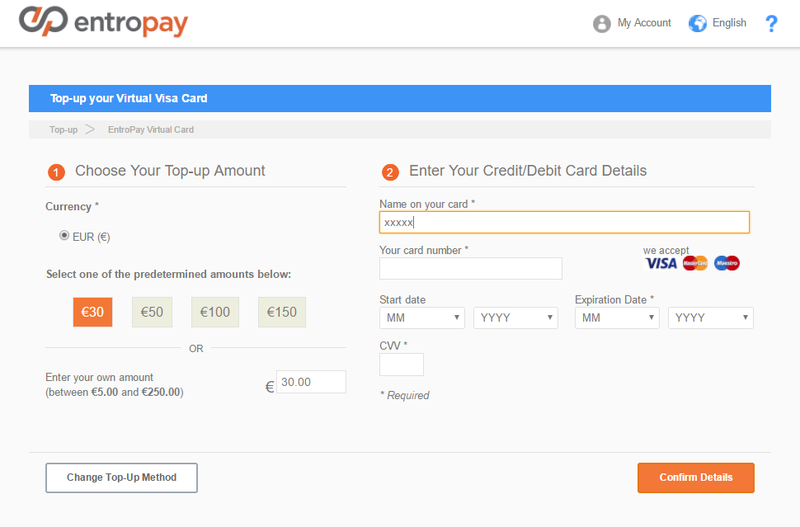 Close EntroPay account / Withdraw to credit/debit card. Check the following table to see all funding limits for your EntroPay account and your virtual credit cards. Some limits may be increased according to your account balance. If you have any questions about the limits or EntroPay in generel, please do not hesitate to contact us . Funding transaction value per month. Withdrawal transaction value per month. Payment instructions per EntroPay account per day. As you can see, EntroPay is a great choice for every customer who is looking for an easy and comfortable way to pay online with a credit card. The fees and limits are competitive with most other providers and therefore we can highly recommend to take a deeper look at EntroPay. Combined with our eWallet-Optimizer program you will have a great product with even more benefits. Please let us know for any further questions about the EntroPay program, the verification process or the fees and limits.